Being one of the well known traders of different dying products, we are engaged in offering our customers a large assortment of Gold Bronze Powder, which are procured from our most trustworthy and authorized vendors in market. Ultimate Chem (India) Pvt. Ltd. Shade: Natural / synthetic shades as per our shade card. We are suppliers of premium grade Rich Gold Lining Bronze Powder. The bronze powders offered by us are well known for their excellent green strength, negligible size segregation and free flowing characteristics. 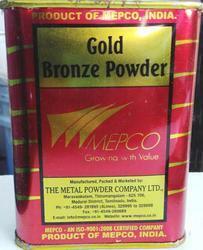 These bronze powders are specially useful for self lubricating bearings, micro-bearings, and bronze sintered parts. Our offered Pale Gold Powder - H is a mid shade bronze powder. Availability in highest purity and smallest possible grain size results into a unique product. This powder is congenial with all the modern powder coating equipment and applications. It also effective in any application where high surface area coverage. We are offering Gold Bronze Powder to our clients. 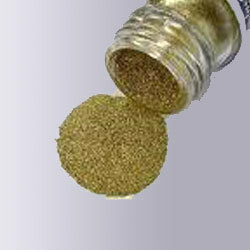 Being a well-distinguished company in the market, we are into offering Gold Bronze Powder.